Toronto's Shan Vincent de Paul is such a mind bending maelstrom of cultural and musical influences, I wasn't exactly sure how to describe his artistry at first. He combines his Sri Lankan background with pieces of modern music and film to create a enthralling and unprecedented patchwork of creative expression. "This is a song giving praise to the people closest to me....All of us have family, most of us have close friends and a few of us are fortunate enough to have saviors. I wrote this for them. The ones that have seen me at my worst and gave me light in my darkest hours...."
With the storytelling abilities of J.Cole and Atmosphere, the passion of Sadistik and crisp, dynamic production courtesy of La+ch, Shan spins an emotive and innovative hip-hop track. He also matches his musical talents with a striking and vibrant aesthetic. While there's no official video for "Fight For Us" yet, check out the killer one-take "Die Iconic". 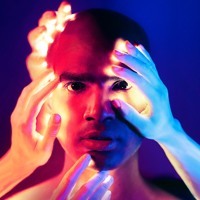 Shan Vincent de Paul's debut album is titled Saviors and will drop April 15. Stay up to date on Facebook and Twitter.